Seafood has always been a favorite food. Fish, shrimp, octopus, mussels, oysters and clams, I like it all. I even like fresh seaweed. As a child, my mother would make clams as a treat. She would saute them with garlic and onion and serve them — shells and all. It was a simple meal and easy to make. But, for me, there was never enough. I always wanted more. When my brother lived close by, he would go to the fresh fish market early in the morning to get fresh fish. He sometimes would come back with Manila Clams. 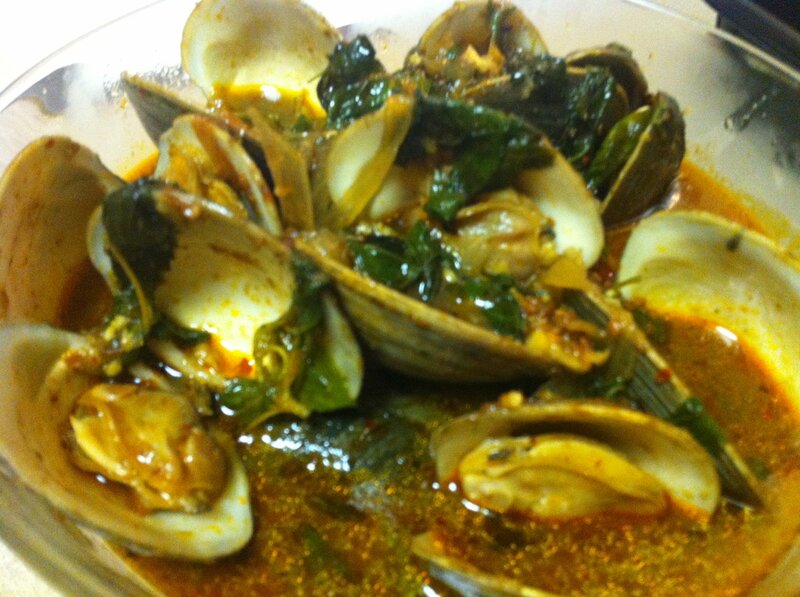 My sister-in-law would saute the clams in the garlic and onions, but she added Thai spices and holy basil. It reminded me of the way my mother made them except my sister-in-law’s version has a hot, spicy kick. Despite the heat, I like the way she prepared the sautéed clams. After a couple of tries to prepare clams the way my sister-in-law did, I’ve come up with this version. This dish can be pretty spicy. Control the heat by watching your chili pepper and chili paste portions. By the way, the fresher the clams, the better the dish. And, once the clams open, discard any unopened ones. They are usually filled with mud. Serve this dish hot with steamed rice. Soak clams in a bowl filled with water for about an hour to clean out any sand that may be in the shell, changing the water if the water gets sandy. After soaking, rinse and scrub, if needed, the clams and let them drain. Slice the chili pepper lengthwise into thin strips. You can also substitute red bell pepper or other sweet peppers, if you don’t like it hot. Add a tablespoon of oil to a wok over high heat. Add garlic, onion and chili pepper. Cook until garlic is fragrant and onion clear. Add fish sauce, shrimp and chili paste, and sugar. Stir to mix the seasonings in. Add clams and stir. The clam juice will start to come out. Stir until all the clams open. The clams I use open after 4 minutes of high heat. Add Thai basil. Stir until leaves begin to wilt and quickly remove from heat. Mix in the green onions and place the clams and liquid in a serving bowl. Serve hot with rice.